Always prolific in recorded output and regular live performers,Tangerine Dream could be accused of leaning towards an American audience of late. 1995 sees them up for their sixth Grammy nomination in as many years whilst preparing for an extensive North American tour with a forthcoming studio album ending their current compositional "cycle". In a Keyboard exclusive, JONATHAN MILLER reveals all from the legendary electronic music group's Austrian hideaway. Tangerine Dream - these very words conjure up images of a bygone psychedelic era. Yet this innovative German group has eagerly harnessed the latest technological developments to remain on the cutting edge of music for over two decades. Ask a music connoisseur whom they consider to be the world's premier electronic music group. Chances are the reply will be Tangerine Dream and probably always will be, such is their impact. 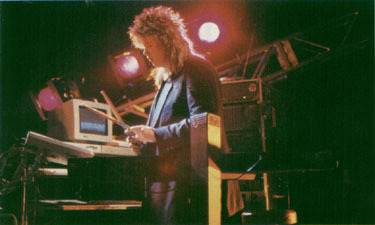 Although 34 musicians have passed through the group's ranks since its formation in September 1967, Tangerine Dream's unique approach to instrumental music has always been a reflection of the philosophies of its visionary founder and mentor, 50 year-old keyboard player and guitarist, Edgar Froese. For many, Edgar remains the living embodiment of the group to this day. As a sculptor he spent time studying under renowned Spanish surrealist artist Salvador Dali, whose unorthodox techniques he later applied to music, resulting in a sound owing little to any other music in the world. The story of Tangerine Dream could easily fill a large book and would undoubtedly make for fascinating reading. Suffice to say, their contribution to modern music production has been immense, as evidenced by numerous Grammy nominations and a host of other accolades - in 1980 the group represented Neue Musik at the Los Angeles Bicentennial Festival, representatives of which purportedly exclaimed, "Are we on the moon? ", when visiting Tangerine Dream's new Berlin studio complex! Edgar Froese: "The Grammy nomination for 'Turn Of The Tides' is now our sixth nomination in a row, so it's good to know that there are lots of intelligent, professional colleagues out there, specifically in the US, who are voting for us with this real musician's award, because the voting members are all musicians and not the general public." I was privileged to be a guest at Edgar's family vacation home in the idyllic surroundings of a small Austrian village on the outskirts of Vienna, a place where lots of soundtracks and Studio records have been completed through the years. Its tasteful decor features artefacts from around the world, reflecting both his artistic roots and a passion for travel. The building inevitably houses a state-of-the-art recording studio, especially convenient now that Tangerine Dream have become something of a family affair. 24 year-old Jerome Froese officially joined his father's group in 1990, having previously contributed an outstanding guitar solo to 'Radio City' from 1989's Lily On The Beach and composed a bonus track, 'Colorado Dawn', for the CD release of the Canyon Dreams video soundtrack of the same year. Jerome may already be photographically familiar, albeit in a younger guise, adorning many early Tangerine Dream album sleeves designed by Edgar's wife, Monique. Outside Vienna, the Froese family can relax and get away from the hectic work schedule that constitutes Tangerine Dream. Aside from releasing albums and touring with seemingly endless prolificity, the group are renowned in film circles for their groundbreaking soundtracks and also heavily involved in sound research at their Berlin headquarters where Edgar and Jerome have additional studio facilities. Edgar himself proved to be an excellent host and I greatly enjoyed our private listening to many hitherto unreleased recordings, including a completely reworked version of the 1976 classic 'Stratosfear', instigated by Jerome and set to appear on their forthcoming album, more of which later. Here it was blatantly obvious that Edgar still gets a kick from music, as confirmed during our subsequent conversation: "It's a day-to-day challenge, improving your own personal abilities and working out how to transform the pure, immaculate world of frequencies into audio signals or so- called music. The thrill is somehow growing and even more fascinating than in the past because there are more unmistakable ways of transferring compositions from the composer to the audience, because of the given technology." Presumably you are referring to the advent of popular music computers like the Atari ST and Apple Macintosh with their sophisticated sequencing and editing software applications? "Before what we call the Atari/Mac time, things were much more exhausting because you could not exceed certain limits set by the given technology. Also there wasn't the world of MIDI connections. One thing is somehow remaining the same and that is the human database with its filters of emotions and experiences. In my personal view, no computer could ever replace those parameters." With a reputation in their field arguably second to none, Tangerine Dream enjoy world-wide sales extending well into seven figure territory with over fifty album releases to date - not bad going considering electronic music has never courted mass appeal, although Edgar deplores the term: "We have never called ourselves an electronic band or said we are producing electronic music, which is something completely different." Nevertheless, their longevity in an age of increasingly disposable music speaks for itself and can perhaps be attributed in part to the relationship between the many changes in the group's line-up and the composition process itself, as well as the natural evolution of the music technology involved. "The composition process is changing all time and that's necessary and also very important to keep away the process of what I would call an artistic crystallisation which could easily become part of the development if you do not break things up from time to time." "It's a big advantage in the general philosophy of the band which has very often been misunderstood by the audience. As human beings we are very often habitual creatures in a common sense and feel ourselves threatened by unknown changes in all fields of life, specifically in art forms where we want to stay within given frameworks." "As soon as things are changing drastically or dramatically, a lot of people no longer want to follow us because change and development frightens them. It's like their life is changing and that's what most people don't want. It does not matter if you are a writer, painter or a musician, people get used to something and it becomes part of their life." Changing directions in Tangerine Dream's musical career always seem to coincide with the introduction of new members. Do they always influence these new directions? "There is a biophysiological trigger between human beings and hopefully that leads into some new musical arrangements. The human factor has to come first so we always spend a lot of time with people without playing an instrument, just checking out chemistry because sometimes you have to be together for weeks or months in a specific situation, like touring." "If the human chemistry doesn't work, very often it doesn't matter if you've got a genius in a band because there is always trouble. I prefer to work with someone who just wants to express him or herself in a band rather than be a superstar." Very few artists survive the capricious music business world long enough to be joined on record and stage by their offspring, yet another testament to Tangerine Dream's endearing qualities. Parallels can be drawn, however, with keyboard virtuoso Rick Wakeman and his son, Adam. I asked Edgar whether Jerome's joining was a long term dream: "It was not my dream at all. I remember it was more a kind of nightmare if finally it turned out to be reality that he might run into music in general. Even later on, when it became very clear that he would become part of Tangerine Dream, I was worried, because after 25 years I know so much about the business - all those background stories that necessarily become part of what you are doing whether you like it or not - and he knew such a small percentage of this." "I thought it would be much better if he had moved into the artistic side of expressing himself by choosing something else, but it was of his own free will and I myself, more as a companion and colleague than as a father, appreciated it and we still have a very good relationship." This prompts the obvious question as to whether the traditional father/son relationship sometime poses problems when working together? "Whilst working together there are so many other parameters which are much more important and in the foreground of our activities. If we delivered a bad piece of work, for instance, something far below our real abilities, that has nothing to do the father/son relationship. A bad piece of work is a bad piece of work, so we have a little agreement between us that we can criticise each other very harshly on whatever stage of the working process and that's exactly what we do. This lifts up the quality of our work instead of bringing it down because we have a family relationship. So working together means being absolutely honest, as we try to be with all our other colleagues." In what ways has Jerome musically altered the group? "He unquestionably brought in a bit of fresh air because he was listening to different music to me, because of his age. He very often criticised Tangerine Dream for becoming too structured, for instance, and had a few arguments to which I carefully listened. We had long discussion about music and he listened quite carefully when I had the chance to give him some indications where it's necessary to work in a professional, structured way. He is musically educated, but not in a classical way, so he has a different approach. There is a good counterpoint of interests and this can be heard on the products we've released together so far." For many years Tangerine Dream traditionally worked as a trio and Edgar has been quoted as saying that a triangle of interaction was especially useful in a live situation where it could be war-like with three musicians working two against one or peaceful with all three performing together in harmony. However, recent Tangerine Dream albums and tours have witnessed an abandonment of this concept in favour of introducing sessions musicians in guitarist Zlatko Perica and saxophonist Linda Spa, as Edgar explained: "An artist has to be faced with a challenge every day and if you go on doing the same thing for years and years there can't be any challenge, so it's a bad thing. I'm personally not interested in working on things which have a taste of yesterday." Given that you co-composed the bonus track on the European version of last year's Turn Of The Tides with Linda, is there a possibility of more musicians joining Tangerine Dream on a permanent basis? "No. The last time I tried that was with Paul Haslinger and it did not work out at all. I can't complain about it because I had to learn that people need their own space to move and create their own experiences, even if this means running into a brick wall. You cannot protect them from doing so." "Linda is, and will continue to be, a great help. She is a very funny companion and also a very talented composer which will maybe be proved again quite soon." Edgar often performed guitar parts in the past, both on record and on stage. Similarly, Jerome is no slouch when it comes to finding his way around a fretboard, so the need for session guitarists is simply a case of ergonomics: "Jerome and myself cannot play keyboards and guitar on stage at the same time." There was a period in the early 1980s where you did not feature guitars at all. Around the time of the infamous Polish concerts, for example, you did not even perform a guitar solo. Why was this and what prompted the reintroduction of guitars into the Tangerine Dream sound? "In the old days we had lots and lots of discussions when it came to the guitar because I myself had to play the guitar from time to time. The other members didn't like it at all, but they didn't like the guitar generally, so we always had a bit of a problem and that was sometimes quite hard to get through." "Also for quite a long period of time the guitar would have drawn too much attention from other musical structures, so that was something we had to keep in balance - the interest of adding guitars as well as keeping away from the music that which was unnecessary. That was quite a delicate procedure in the past, but now with Jerome and Linda, they both love guitars and I myself love the guitar. So it's in again and will, I guess, stay there for a while." So do you consider yourself to be primarily a keyboard player or a guitarist? "As a composer, I am obviously more of a keyboard player and as an instrumentalist expressing deeper emotions, I'm a guitarist." A few years ago I wrote to Tangerine Dream and received a somewhat esoteric reply stating, "Some wise guy once pointed out that talking about music is like dancing about architecture." This especially rings true when discussing instrumental music, but I could not resist sticking my neck out by asking Edgar how a typical Tangerine Dream track, if indeed there is such a thing, is composed and recorded. "It's still the same, like in the old days. We could start very simply with a bass line the function of which is like the old basso continuum in Bach music, and then move into nearly a classical counterpoint structure with up to five or six independent voices, like in Bach's counterpoint stuff, for example. If you do this in popular music today most people would not realise what really goes on, but that's not a point you can think about too much because it's a personal way of describing things." "We also work in a very normal way, starting with a melody line, moving into harmonising melodies and adding rhythm, bass and drums, so for us it's a matter of choosing how to compose and record." Having established that change is an integral part of Tangerine Dream, how have your latter compositions developed from your earlier ones? "As I've said, things are constantly changing, but the problem is keeping what we call the red line - a kind of background situation which will very often not be heard in the foreground. It's more a mental part of what we do and that's very hard to describe, like describing emotions." Or dancing about architecture. That said, you no longer compose or perform the so-called atmospheric or "spacey" sections of music for which Tangerine Dream became recognised. Why is this? "The reason has nothing to do with music because Tangerine Dream is a kind of concept, starting in September '67 and going through many different stages and levels. The red line is going through it all, but Tangerine Dream is like breathing - the first twelve or thirteen years was breathing out and the other decade is breathing in. The simple concept is the inside and outside world. It's more complicated if you go into it, but breathing in means that by the natural aspect of breathing, it's inside and not spacey. It's not macrocosm, it's microcosm." Likewise your current compositions are generally a lot shorter than in the past. 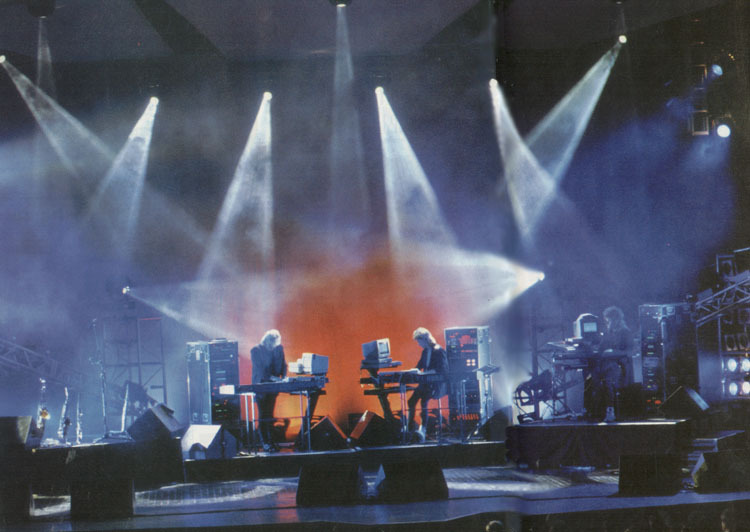 When interviewing Klaus Schulze, himself a former member of Tangerine Dream, for the June 1994 issue of Keyboard, I asked him why he has never performed in the United States given that Tangerine Dream have successfully toured there on several occasions. He replied: "Well, in their first American concerts Tangerine Dream played long pieces, like myself, but as they spent more time in America they shortened them, because that's the American way of entertainment." Would you agree with Klaus' assessment? "Here I absolutely disagree with Klaus, because the length of our pieces has nothing to do with America or experiences we've had in America. When I came to the States for the first time back in '74, I stood there for quite a while and immediately got hit by all the commercialism, the short top 40 radio pieces and everything. Even then, I had no intentions of shortening our pieces right away. The length of our compositions has much more to do with reading - sometimes you want to read a novel, then maybe a thick book about different philosophies and once in a while you want to read short stories. I would say the composer has a right to follow the same line as a writer does, for instance." Many notable former members of Tangerine Dream live in the United States. Much has been written about the departure of Peter Baumann, founding father of Private Music with whom Tangerine Dream ironically later signed in Los Angeles, and Christopher Franke, Edgar's longest serving music colleague of seventeen years now residing in Los Angeles as a successful soundtrack composer in his own right and a respected member of Keyboard's Advisory Board. Perhaps this mass exodus can be partly explained by supposedly greater financial opportunities on offer - a terminal dose of what Edgar fondly refers to as the American influenza. Not so well documented in the exit of fellow Los Angeles "casualty" Paul Haslinger in early 1991. When Keyboard last featured Tangerine Dream in their November 1988 issue, Paul appeared to be very enthusiastic, so why did he choose to leave? "Paul had the American influenza, which can only be healed by moving to the place the influenza comes from. It's what I personally call traveller's homeopathic therapy. So Paul lives like most other former Tangerine Dream members in LA. He was, and somehow still is, a very talented and funny companion. Unfortunately, he got screwed by a few people in the LA business, but I personally wish him the very best because I know LA specifically can be a monster and, before you realise it, you find yourself in the monster's stomach eaten for breakfast! Hopefully, Paul will hear his wake up call in time. He has just released his first solo record called Future Primitive and made a quite interesting approach into what I would call a bizarre landscape of sounds. I hope he can continue that way and, of course, wish him a lot of luck." Given that musically you appear to be leaning more towards an American audience these days, at least in terms of touring and record companies, why have you chosen to resolutely remain in Europe? "First of all, as a whole band we love the American audience. They are somehow emotionally very warm, direct, uncomplicated and open. But loving these people and is one thing and spending your entire lifetime over there is something completely different. My personal roots are growing very deeply in the ground of Europe. Lots of my musical inspiration is European-influenced. It's like my backbone. Many years ago I remember I wanted to move to Australia maybe for one or two years, but even then I would have come back to Europe." Some former colleagues are still European-based. Do you remain in contact and have an opinion about their post-Tangerine Dream work? "I'm in contact with Johannes Schmoelling. He lives in Berlin too where he runs his own private studio. He's producing quite a lot of music for theater plays and I quite like the stuff he does. I've known Klaus Schulze for many years and he is producing masses of music so that even I can't listen to it all. It's his philosophy of doing it and I get the impression that he needs that sort of workaholic way of playing around with sounds. My contact with all other former band members is zero." When American realist director William Friedkin asked Tangerine Dream to score the music soundtrack for his follow-up to The Exorcist in 1976 to much critical acclaim, the group found themselves in the unlikely position of Hollywood darlings. A lucrative second career ensued funding vast amounts of unique custom-built equipment put to mind-blowing use on record and stages throughout the world. With today's commercial music technology readily available at more realistic prices, soundtrack work no longer plays such a vital role and Edgar's reason for cutting back on this activity provides another interesting insight into his psyche. "It has no real relevant aspect right now. We refused to compose five scores in 1994 alone. We are not interested in these bloody, horrific, macho-type of car chasing thrillers and war killers." "I often asked myself which brain in this terrible, horrific world of lunatic humans and monsters needs a second illusion which illustrates all of this again on a big screen just for money purposes. Tangerine Dream did some scores a few years ago which I personally will not identify myself with any longer. As a composer, you have a responsability to what and how you apply your mental creativity. I am realistic enough to know what a good thriller is, without having to see heads and legs getting cut off in slow motion, five times in a row. However, if a great movie comes along where we feel we can talk to the director and producer and find a way on an intelligent basis to work things out, then we are definitely on again." In the past you worked with Michael Mann on two occasions. Is it true that he approached Tangerine Dream with a view to scoring the music for Miami Vice? "We heard that Michael originally was interested in us because Thief was quite a big success for him personally and it was a kind of music that had not been heard in movie theaters before. So when he started thinking about the score for Miami Vice, he thought about us too." "But we did not talk about it because at the same time we signed up for what was supposed to be another big TV series in America, so we could not even meet. When we signed the contract for Streethawk, it was supposed to be about thirty to forty sequences, but after a big take off the series died after twelve sequences and Miami Vice went on for years." "As life goes, I was never depressed about it because I know Jan Hammer didn't know whether it was a huge burden or if he was quite lucky to sign for the series. It brought him a lot of money, but artistically I know that it is hard work to go on and do three or four sequences every month. That's about an hour and a half of music material." In this case, it appears that Jan Hammer attempted to compose in a similar style to Tangerine Dream. "That's true. Jan Hammer did lean his stuff quite closely to what we were doing specifically at that period of time, but what can you do about it? He is a very talented musician and overall he did a good job. I'm very happy if a talented and true musician on this planet has enough money to make a good living and can be creative. If there is sometimes a crossfade of interests, I would say as long as you are creative and original there is enough money and work for all of us." It is particularly ironic that Christopher Franke considers electronic music to be seen in some way as second class in American film circles since it is sometimes produced very quickly and simply. With this in mind, he has formed the Berlin Symphonic Orchestra for soundtrack work in a quest for melding electronic and acoustic instrumentation. This, together with his assessment of Tangerine Dream's current music losing its original appeal, understandably cuts no ice with Edgar. "I have to disagree with Mr Franke. I would say an outstanding Hollywood film composer is, and has to be, a professional and extraordinary artist, no matter if they make music by blowing into a glass bottle or conducting a 180 piece orchestra. That is common, artistic law in the business, so if you want to stay there for many years, permanently increasing your professional abilities and reputation, then you have to be that way. But there are great synthesizer scores and great symphonic scores - apart from our own work - Vangelis and Zimmer have also shown brilliantly how it perfectly works in both directions. There are great scores featuring just country music or scores just compiled from songs. No matter what it is, it's just music, so to say electronic scores are out of fashion is absolutely incorrect and simply one subjective opinion by Mr. Franke, who might have a reason to think so." Fair comment, but it is true that Tangerine Dream have also employed orchestras in the past. For example, in the early 1980s you worked with the Munich Philharmonics for a European television appearance and your version of Ravel's orchestration of Mussorgsky's 'Pictures At An Exhibition' on Turn Of The Tides features the Vienna Horn Ensemble. On your brand new release, Tyranny of Beauty, there is the orchestral version of Frederic Handel's Largo. "We have always tried to introduce different sound colours into our music and we have from time to time used orchestras on our records. We've found it rather stupid to put different value parameters to the use of technical hardware or the stylistic side of human software - it is the quality of the composition which counts finally. One of our next steps will be to perform an orchestral versions of Tyranny of Beauty with the Vienna Philharmonic Orchester in Europe and possibly the Pittsburgh Symphony Orchester in the USA and we also started composing a classical music play to be performed in Sydney, Australia in 1998 - it will be Dantes 'Divine Comedy' for full orchestra and mixed choir. So we are quite into classical scoring, but inbetween we will continue with our other work including electronic sound research and get the same results." 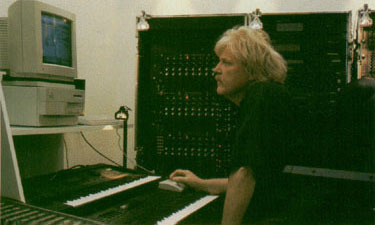 Referring to his latter days with Tangerine Dream, Christopher Franke is on record as saying, "We did not have the time to explore our minds or the great computer instruments we had at our disposal. Kids with much more time than us, but less experience, began producing better sounds, and I began to feel our quality was dropping. This was a very bad feeling for a group who always wanted to be on the cutting edge of music." Have you been able to remedy this situation in recent years? "An artist must be judged by what he 'does' and not by what he says. Mr. Franke is speaking for himself in this case. Within the last 8 years - after his departure from T.D. - he had the opportunity to show what he really wanted to do 'without the pressure of the band'. So judge him by the work he's done on TV scores and other compositions: If that's the cutting edge of music he wanted to move into, then others may judge this - No comment from my side. Tangerine Dream's inner quality of composition always had other goals and perspectives than often described even by some of my former colleagues, I'm personally not a speedway-donkey on the cutting edge of musical opportunism - people who can and will listen to the body of our music, know this." So what have Tangerine Dream been up to lately? Well, having done sequencer work for about eighteen years, Edgar has talked about their recent albums of shorter tracks in terms of "song structures", stating, "that period has now ended with a record we will be releasing in early '95." What can you tell us about this new record? "The one that's finishing this cycle is called 'Tyranny Of Beauty'. It was born out of the fact that the term beauty is more and more ruling a big portion of our day-to-day lives. Models have become extremely popular. Work-out videos are always top sellers. People try to re-shape their bodies to become more beautiful, but what about all the so called 'normal ugly ones ' who can't measure up to all these beautiful images ? 'Is anybody out there asking to re-shape of our terribly confused mental structures which rule our daily lifes from tragedy to tragedy ? Everything is being brought back to the individual and that's part of the materialist world. You suddenly realise that this world doesn't look beautiful at all, so the record is somehow a bit of a final description of the way all things have to go and that's why the cycle ends that way." "With the start of the next cycle on the next record we have a very optimistic forecast of another area with things starting much better and even ending much better, but that's something different. So, talking about Tyranny Of Beauty, that's what it's all about." You then said Tangerine Dream will be going, "in a completely different direction. In terms of technologies, it will change the complete process of composing. We will have a short break for about a year, change systems and places, and then be back in early '96 with a completely different musical approach." Can you expand on this statement? "No, because even for ourselves it will be quite a change and so it would take too much away from it's integrity and impact if I started talking about it." In changing "systems and places", will this involve physically moving, perhaps to the United States? "Let's put it this way: It will be a move, but not in terms of location and we will not move to the US, except for longer or shorter visits." Your ability to smoothly join one distinct section of music to another always made for fascinating listening and, to a certain extent, you still do this in concert. Is there a possibility of Tangerine Dream composing longer tracks again? "Yes, I guess we will on what we call the new style release, but people should not be surprised because even long pieces will have a different meaning to us, so it's not always the timing itself which makes the piece long." TANGENTS: 1973 - 1983 Edgar spent much of 1994 comfortably ensconced in the studio compiling Tangents: 1973 - 1983, a beautifully packaged retrospective boxed set of five CDs of studio; live; soundtrack and unreleased recordings dating from Tangerine Dream's seminal years with Virgin Records. He is credited with all remixes; arrangements; additional recordings and, in some cases, re-recordings - a mammoth task indeed given the vast Tangerine Dream catalogue from this period alone. "As far as the public reaction is concerned the boxed set is quite successful. A lot of people like it and somehow a lot of people were waiting for it, so because of that I've got a lot of offers for those records produced between the period of '83 and '88 - almost another ten records. They're contractually free and ready to be re-released. Maybe they could form another boxed set, but there's no hurry and the Virgin boxed set was such a terrible procedure in terms of work that I have to give myself a rest." When making additional recordings it must have been difficult to select new sounds that would sympathetically blend with the original atmosphere of the tracks? "I had to break into the very specific aura of the old days, otherwise I would have had no chance of reproducing anything. That gave me a lot of headaches because musically I did like the time, but mentally and for some social surroundings I did not like the time very much, so it was a heavy procedure for myself mentally to move into that period of time again." "Sound-wise it was not a problem at all because I have all the hardware and necessary software and just had to pick up the right piece of equipment. Everything is MIDI-fied, so I could easily connect things. That was the cool part of the story." How did you go about completely re-recording tracks like 'Logos (Blue Part)' which are instantly recognisable, yet brought up to date into the current Tangerine Dream style? "There was an idea of showing a bit of the red line which runs precisely from the very early days of Tangerine Dream, even from the days when we did not record any records in '67/'68. So it was a good opportunity to move into various aspects of our music from what I would call anarchy to conventional structures and back again. Sometimes I could stay within the given parameters and sometimes I added new sounds just to show the progression into different areas. 'Logos' specifically wasn't that difficult because basslines and chords are already more conventionally structured in the original 1981 version and also the melody lines do not contain too much ad lib playing - so this was just half as complicated as for instance the 'Ricochet' or 'Force Majeure' stuff, which had much more improvised sequences with lots of random events in all parts of the composition. The work on these tracks brought me to the edge of my patience and my own musical abilities as far as reproductive creativity is concerned." "You have to point out clearly that working as an artist with very precise ideas of what you want to do and later on listening to the stuff as part of the audience and following their pre-conceptual ideas of what Tangerine Dream has to be is a completely different story. People should respect the artist here, I guess." Did you record new parts onto the original master tapes or digitally copy them beforehand? "I would say I did everything possible from the remixing of original 8-track and 24-track tapes to doing recordings parallel to the sometimes very noisy original quarter inch master tapes and then taking the original away, leaving the new recording which obviously then had a very strong correspondence to the original." "I did some overdubbings of some endings and starting points of pieces that had to be cut for inclusion on the boxed set because they were originally 18 minutes long and I was only able to use six or seven minutes. As working tools to do the entire process I used two Mac Quadra 650 (32MB Ram), two Mac Quadra 840 AV (also 32 MB). Pro Tools Harddisc Recording (16 Track) using 4 Quantum Empire Harddisc's. Sequencer Software Cubase Audio DAE and Opcode's Studio Vision Pro in connection with Galaxy Editors. Midi routing: Opcodes Studio 5 LX. For various Soundtreatments I used Digidesigns DINR Noisereduction and the L1 Ultra Maximizer + Q 10 EQ from WAVES. Another treatment was given to the final master with the Junger Audio digital dynamics processor D 02. Various parts of postproduction equipment are custom build for very specific needs within the studio periphery." "Specifically the endless process of equalisation given to all sounds has taken a big portion of time. I think that it does not make any sense to give exactly the same thing to people who already have the entire Tangerine Dream catalogue, even on CD. There has to be a difference in soundquality and musical treatment otherwise there is no point in them spending their money on something they have already got. For this reason I do not understand the point of critics from some quarters who say, 'Hey, why did you not leave it the way it was?'" Some years ago you stated that you counted around ten triple albums worth of unused material dating from your last years with Virgin Records. Christopher Franke claimed that by percentage you were responsible for the group's organisation whilst he concentrated more on the music production side, although a degree of overlapping did naturally exist. Given that Tangents: 1973 - 1983 is intended as a Tangerine Dream retrospective, some would argue that it is strange that the majority of the unreleased tracks on are solo recordings by yourself. "First of all, lots of thanks to Mr Franke for his dignified description of my musical envolvement in Tangerine Dreams work - is it a joke? It is true that I am a musician and a businessman and Mr. Franke profited from both my efforts. It's far below my professional attitude to move into more precise description of Mr. Franke's strange memories. The fact is, that both of these gentlemen - Mr. Baumann and Mr. Franke - were not available at the time this project needed to be finished in Berlin. Baumann was not doing music anymore and Franke was scoring TV series in LA. I had to find my way through hours of material which could be used for this project without waiting for their comments. Please understand that it is waste of time to explain this unpleasant background." Live performance has always been important to Tangerine Dream. Only their numerous other activities prevent Edgar from going out on the road more often, such is his enthusiasm after so many years: "Unfortunately, we have always had a schedule problem. We have private contacts in Japan and go there often because we are involved in some equipment developments but we simply cannot play there at the moment. It's a similar situation with Australia, but there are quite a few things you have to plan long in advance and some others, which are quite important for the development of the band, will come in on short notice." Many early tours were plagued with problems due to the unreliable nature of the equipment involved and, on the whole, these problems have now been overcome: "It's still a difficult situation because a stage is not a studio and a bumpy road is not the backyard of your living room. So, bearing that in mind, you have to have a live set which is resistant against most of the troubles you are not usually faced with in the studio." So how do you decide which instruments to use on stage? "We've got a very easy way: We throw each piece of equipment three times out of the third floor of our studio complex! If it's still functioning properly, we'll take it on the road. If not, we send it back to Tokyo! No, honestly, we have to carefully consider what to put into our racks and sometimes the luxurious editing of some sound textures has to come second." The impact of Tangerine Dream's first North American tours in 1977 is well known. How would you compare the experience of your last visit, captured for posterity on the 220 Volt live album and Three Phase video in 1992? "Through the entire 1977 USA tour, we had these tuning problems with our analog modular equipment as well as adjustment difficulties with our keyboards. From unloading our gear to loading it up again after the gig, the whole tour was headlined as a trouble-shooting nightmare." "Today, if a technical problem comes up during a tour, you just call up one of the 100 addresses around the country and you will get gear replacement or other technical support within a short period of time. Back in 1977 over 80% of our equipment wasn't even known to most musical technicians and equipment companies. We had to fix lots of things ourselves." "Compared to the old days, we now live in a wonderland as far as tuning and equipment support is concerned. 99% of our live equipment is software controlled, so you easily have access to all the parameters of your gear on the monitor in front of you - that is technical paradise compared to what we went through 20 years ago." The 1992 North American tour saw Tangerine Dream performing in more intimate night-club surroundings in addition to larger venues. What are your plans for the forthcoming tour? "There is the plan to tour North America for five to six weeks in Autumn '95, but that will maybe be the only tour because it will tie in perfectly with our other activities here in Europe." "We are definitely not into equipment bombardment like some people believe it must be done today, so everything will be broken down to a minimum and we will go on with those things which are really necessary to perform music. Of course we will have a good show, but people should not expect a Floyd show!" Do you consider yourself primarily as a composer or a performer? "I am a performing composer!" 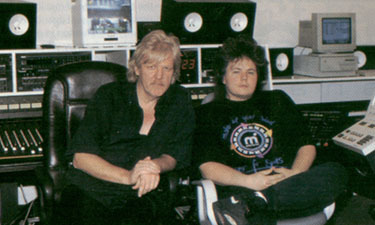 Tangerine Dream were one of the first groups to realise the benefits of owning their own recording facilities, having previously run up exorbitant costs recording the likes of Stratosfear in commercial studios, although this proved problematic in itself: "In '76/'77 Peter Baumann decided to build a recording studio. When it was ready to go we were in the middle of an American tour. He had been flying back and forth to check out the studio and then coming back on tour, but finally he announced that it would be his private place and that he was stepping into commercial business. That was not the way it was supposed to be and was a contributing factor in splitting the band. I myself did not feel very comfortable with his decision, but that's a long way back and long forgiven." Presumably you moved to your present studio location when Christopher Franke left the group, taking his impressive Polygon studio facilities with him? "That was the second unpleasant experience I had. We did quite a few recordings and soundtracks in there, but one should not forget that I had to raise most of the money to set it up. I did not invest my private money in his place, but I was always looking around for soundtrack work to get things going, as one can imagine that it cost a lot of money. After the decision was made not to continue anymore in August '87 I had to look around again. With help from some real friends I could keep things going, so I went through that period as well and learned my lesson." Did you own any studios yourself prior to moving here? "Finally, the aim was that each member of the band had his own recording place to work independently and prepare things, because if there was just one big studio and one member was working or trying to do his sound research then the others would just be hanging around and waiting. That would not be very economically wise, so we then decided that we should have some smaller, independent places where we went to do our work and then move together in a bigger place to finalise and finish everything." "Now that is long gone and today Jerome and myself are running a couple of places, but the fact is that during the last 25 years we know so many people around the world where we share studio time and places. When they come to Europe they move into our place and when we go abroad to Asia, America or the UK, we call our people in advance and there will always be spare time available." Digital developments have obviously revolutionised the entire recording process and it is a medium that Edgar has embraced wholeheartedly: "Funnily enough, I never moved into the 24 or 32-track digital recording procedure in one of our own places because I've never ran a really commercial studio, so the studio was always designed for our own needs. We easily could have got one of those bigger systems, a SSL Console and a 32 Digital Multitrack but I know from colleagues that one day you have to go commercial because of all the daily costs involved, so you easily could lose your independency - a situation which we didn't want to run into." "What we were looking and waiting for until it happened, started with all those AudioMedia cards -SoundTools, ProTools - hard disc recording in general. Instead of having big mixing consoles in the studio we use the sequencersoftware integrated midimixing facilities. We also installed three different working platforms which operate as a network. So Jerome and myself can work totally independently, using the same Soundlibraries or other software incl. our 8 Gigabite storing unit. We can dump parts of a composition from one system to the other to continue the working process while moving from my midified composition over to Jerome, who is then working with his guitar on the audio tracks or the other way round. It's very time-and energy saving. We expanded our harddisc recording and we use now two 16-track Pro Tools systems after the very good experience with Digidesign Products during my `Tangent' Production. What we love is that the whole thing is a completely open system and you can easily upgrade and expand everything, if you like." "All our 'special sounds' are transfered for ultimate use to our CD Rom library which are manufactured by ourselves using the Philips CDD 522. Whenever something is finished on hard disc we do our DAT streamer backup or copy our tracks digitally onto various synchronized ADATs for extra safty and take everything to another place and continue working on it. That makes it quite easy because most of the studios that I know have got some ADATs and some sort of hard disc recording. That's not a problem anymore. We've saved a fortune on commercial studio time over the years. Sorry for the big places, but I guess they will make their money anyway !" Do you have an opinion about the ongoing argument raging over analog "warmth" verses digital clarity? "That's a question which has history. On digital recordings it's said there is a certain frequency range where a sound could become a bit metallic. "For instance, we've made tests a few times in our studio here and at a friend's place in New York. We played analog and digital tapes to the same people. There were musicians and sound engineers, most of whom had knowledge and experience in listening to sounds. Most of them, believe it or not, quoted wrong." "We then thought about whether it's a psychological, preconception thing by having a different opinion, or is it really a technical thing? In the end, I gave up discussing it. I suppose every sound engineer has his own little secret and his own opinion about it." Presumably the mix is effectively created at the composition stage on computer? "That's exactly what we do. As I pointed out before we're working only with software mixers and they're normally part of the sequencer program. We've given Steinberg's new Cubase Audio a few special treatments and we feel that composing and mixing has never been easier than today. The big mixing console in one of our places is just used for acoustic signals like chamber orchestras or times where we have to remix stuff from previous recordings we did years back on analog 24 multitrack. Sometimes we use it on request for one of those final dubbings we do for scores or sound effects which for some reason don't necessarily have to run through a computer." "If you listen to all of Tangerine Dream's albums chronologically, you practically have a history of synthesizers, sequencers and samplers, with up-to-date analog and digital sounds." There is, of course, more than a modicum of truth in Edgar's sweeping statement, although a pre- warning of his alleged reluctance to discuss music technology was alarming and proved to be unfounded in the event. It is almost inevitable that the subject would rear its ugly head at some point in the proceedings when talking shop with Tangerine Dream and I found Edgar to be a willing participant after all. Do you ever look back on the days when you were looked up at in awe because of the unique equipment you had at your disposal which other amateur musicians could not afford? "In my own musical world, and I think every true musician and composer will agree, you should never think too much about what others do or have. The moment you are absolutely unique with the musical micro or macrocosm of sounds, it does not matter whether that particular feeling hit you whilst sitting at a $100,000 concert grand piano, or by pressing keys on a 200 buck Casio keyboard, which has maybe been stolen at twilight from the backyard of a department store because you couldn't afford it!" "To me, music has absolutely nothing to do with this materialized world of unpleasant and destructive ways of human behaviour and living. The world of music is something on it's own. It's absolutely dust-free, clear and clean. Music is one of the most neutral things on earth. It symbolizes the 'highest frequency' of all art forms in it's abstract, neutral manner." 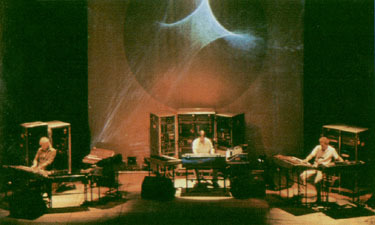 This may well be the case, yet it is debatable whether some of Tangerine Dream's groundbreaking recordings and concerts would have been entirely possible without involving their custom-built equipment, much of which remains in Edgar's possession to this day: "I still own all of the analog equipment and it's stored in a basement somewhere in Germany." With the current analog revival, Edgar's reluctance in divulging the location of this Aladdin's cave is understandable and Jerome later rekindled my curiosity by revealing that the large, heavily customised modular synthesizers with the overhead lamps visible on the sleeve of the 1977 double live album Encore are also in storage. I jokingly suggested that if the whereabouts of these highly desirable items ever came to light, then Tangerine Dream should consider hiring around the clock security guards! Obviously Edgar has reason to hold onto his analog gear and an interesting theory behind the popularity of second-hand analog equipment today: "I laughed back in the days when people started selling their entire analog equipment because of the Yamaha DX7. If you are used to the process of creating sounds electronically you should know that FM sounds could never create the same frequency structure as a low or high pass filter influencing the waveform of an oscillator. It's a completely different process. The voltage controlled principle invented by Bob Moog, and brought to a variety of high class hardware equipment by Tom Oberheim in the late '70s and early '80s, simply cannot be reconstructed by FM synthesis. One should ask Bob Moog about his fantastic voltage controlled filter. It was a miracle and he could tell you even more about the actual given process which I guess is still unbeaten today. Without Bob Moog and Tom Oberheim, TD's history would have to be re-written. Both are great minds. They should be credited on "all" pop and rock records these days." "When talking of a warm sound, what people believe to hear is not really the sound source but the image of a sound created by a filter. The filter is doing the mass of work and that can partly explain why analog is a completely different world. If you give up analog you give up a big portion of your musical ability, technically." I asked Edgar whether he would consider using any of these devices again: "It depends. On 'Tyranny' you hear Moog and Oberheim Sounds from beginning to end. If it's necessary to do something, then I will. Everything is functioning and MIDI-fied now, so I just hook it up and it works." Once again, Jerome provided more specific information, stating that a Korg VC10 vocoder had been pressed into service on a track of Tyranny Of Beauty, called 'Catwalk'. Also the old four voice Oberheim, the "original" incl. 16 Channel Programmer from 1978 can be heard. Musically Edgar is clearly not one for looking back, yet, according to Jerome, he is in "his element" when playing the likes of the Roland Jupiter 8 and Jupiter 6 analog polysynths nestling comfortably alongside their digital counterparts in the studio during my visit. A quick glance revealed a Korg T1 (undoubtedly functioning as a master keyboard at an Apple Macintosh Quadra-based workstation), Kurzweil K2000 and Roland D70, JD 800, with numerous rack- mounted modules, including a Korg Wavestation; Waldorf Wave; Oberheim Matrix 1000; Oberheim Xpander; tuning stabilized MiniMoogs; Yamaha TX816; various E-mu Proteus; Roland MKS70; Roland U220; Akai S 3200 and several Quasimidi Quasar, several JV 1080 to name but a few, as well as numerousunidentifiable modules and sound equipment, which defintiely can't be bought around the corner. At time of writing, the group's latest acquisition is a Control Synthesis Deep Bass Nine MIDI- and CV-controlled single-space rack-mount monophonic analog synth module, as reviewed in the February 1995 issue of Keyboard, happily triggering the aforementioned Jupiter 8 "to reach a certain Bassline sound" as Jerome pointed out. Edgar's dilemma in choosing a favourite synthesizer: "It maybe sounds unrealistic, because if you've got so many you must have one you really love, but the thing is I don't look at synthesizers like I look on kids. Quite simply, they are tools and if they don't work the way I want, I throw them out or put them in the basement or send them back to the manufacturer." "I've never had a favourite because it would be like you asking me if the bass line in music is as important as the rhythm or melody. All musical structures have their specific needs and you can't do everything 100% with one instrument." With virtually unlimited access to many instruments and sound colors, I wondered if Edgar felt hindered working with just one instrument on this project. Judging from his humorous reply, this was not the case: "It was a little song which took a little while to do and gave us a chance to help the company selling the instrument!" Do you tend to use each instrument in your studios for a specific role in your music? "Absolutely. Each instrument has a very specific role and a certain identity, so it cannot be used for every part of the composition. You have to be clear beforehand about what you want to do. If not, you get lost because of all the possibilities. Secondly, there are certain needs within a composition which cannot be fulfilled or arranged with each instrument alone. In some cases we've given some of the modules names similar to how they serve us as individual sound entities, so the Micro Wave is " the metal bone", the T1 is called 'Flagship' the Akais are symbolically called 'the pimps' like all the samplers we have, because the variety of services they offer is endless, though their range in quality is still limited in my opinion. The other FM devices get called 'cable cars', we call our analog gear 'fat granny brigade' and so on... It adds a more human touch." For someone involved in such technology intensive music, Edgar's attitude towards sampling comes as a shock: "Sampling is really a subjective opinion and to me it's becoming something like a blind man looking in a dark bathroom for a black spider which isn't there anymore! Sampling has long overstepped the borderline from being helpful to becoming the crutch of helpless musical amateurs and it's not my business to talk about them." "We are now working on different sound events which have nothing to do with what I would call plastic loop events created by most samplers and even sound modules. What gives life to a sound is the random process - irregularity and the unexpected merging of frequencies. What all true artists call the creative mistake. You could never have that in a sample. It does not matter how long it is. You press a key and play it back and it is always the same. "Sound morphing" - what you find in some modules - could have been a good direction, but technical development was stopped before it could take off. Maybe companies like E-mu could not expand on research and development for financial reasons. The Morpheus was a bit of a new taste, at least." Presumably this view is not shared by Christopher Franke who set up Sonic Images after leaving Tangerine Dream initially to market a successful sampled sound library, much to Edgar's distress: "When I heard this library, one could imagine that I was just amused and scared at the same time, because it was like a walk through a leafless forest. Some sounds which I could remember very well, came across like a dead warmed up Egyptian mummy. But to be fair , I have to say that Mr. Franke did a good job on the soundtransfer and looping which was definitely not easy to do. But once again: A soundsample is like the two-dimensional postcard from heaven - nothing to do with the real thing." Over the years Tangerine Dream have been heavily involved in sound research, playing a vital role in the development of music hardware and software. Is this still of interest today? "Yes, more than ever, but we stopped talking too much about it because lots of things have been invented that are identical to some bizarre thoughts we ourselves had about sounds and music. Ironically, people began to manufacture hardware and software exactly as we had spoke about it and released stuff in different market places under their own logo without even mentioning our name. That was not very polite and we went through that procedure quite a few times." "So you can be sure that anything new I talk about right now, in terms of hardware and software, is already trademarked or we ourselves are the patent holders. That's the way we've had to organise things through the years." Edgar is obviously in a better position than most to speculate on developments in music technology with some pretty startling future predictions: "For some reasons I'm absolutely sure about what way technology will go. I could give you a little example: The original way of composing music, like it happened at the time of Beethoven, Mozart and Bach, is gone and not possible anymore. There is a spiritual background as to why it is not possible, but that's not part of our conversation. As far as what I call the crutches are concerned - those things which help you move for a while because the original way of walking is not possible anymore - within ten years we will move into a completely different way of data memory storage to what we know now." "The entire storage system will be replaced by what could be called PMUs - Plasma Memory Units. This will allow for three dimensional data processing and data compression, so we can assume that this memory system will have a storage capacity which is practically unimaginable today. These mass memories will be used in all the usual data processing areas since they are not limited to one particular use of course." "There will no longer be serial or parallel data busses. All the data stored in the PMU will be ultimately accessed through a fibre optic system which will have been developed and put an end to all the known forms of interfaces, as well as that which we could call a cable salad in studios and other places!" "The division between the hard disk and the Random Access Memory, as it is known today, will also become redundant, because the selected and processed data will be parked on different high frequency levels within the PMU. They will not interfere with one another, but will be able to interact simultaneously. Billions of addresses will relate to all kinds of events, structures and 'open sounds'. The musician will become a real 'sound sculptor'." "There will be a world of sounds which we can't even imagine today, because the components creating the sounds will no longer be related to hardware in the old sense of the word. One of the most adventurous things will be the possibility of expressing oneself in sound and that exactly hits the musician. There will be a so-called E-Ball and the E stands for emotional, which counterpoints the human factor. This ball will be hand-sized, made of special synthetic material and will contain a small magnetic field which will respond to a special partition within the PMU." "Calling them by their old-fashioned name, the partial waves available in the PMU will change from one pattern to the next according to the various contacts with the magnetic field on the E- Ball. What we today call touch sensitivity will be called a three dimensional pattern of expression. It will be possible to convert one's impressions in every available sound parameter, without using a keyboard. The sound will be heard three-dimentionally through a large field of vibrating helium, framed by a magnetic invisible field, like a huge invisible box." "How the pitch will be determined is especially interesting because the 12 halftonestep scale will belong to the past too, but that would get too involved. I can tell you that all this is already under patent. It's necessary that the role of the creative composer will also change. For some reasons the keyboard will move away. It doesn't matter what these reasons are, but what you need as a composer is a more ultimate access to store your mental structure without the 10 years training on an instrument, needed to perfectly expressing yourself - that's the main idea behind it." No doubt Tangerine Dream will be among the first to try out this exciting new technology and endeavour to remain on the cutting edge of music for many years to come.